Breaking up is hard to do, but this book can help! 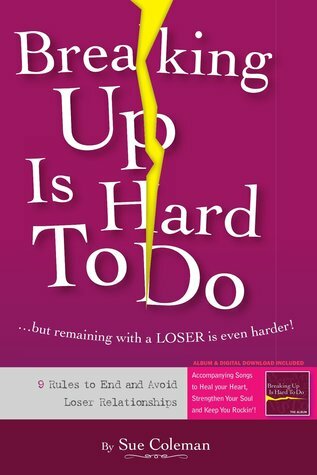 In this wonderful self-help book & CD, Sue Coleman offers women 9 simple rules to end and avoid “loser” relationships. Written from the heart, Coleman’s advice to women in the dating scene is simple, yet very powerful. In the midst of a bad relationship, it can be hard to take an emotional step back and assess the situation. This book helps women do just that, while at the same time reminding them to respect and love themselves. Coleman stresses the importance of the awareness of which “deal-breaker” behaviors are simply not acceptable in a relationship, as well as having a solid foundation in your life through a personal relationship with God. Breaking Up is an excellent book, especially relevant for young women today. A brief read at only 96 pages (108 including the lyric sheets), it’s absolutely packed full of sage advice, helpful anecdotes, and real-life examples from the author’s own relationship mistakes. The book also gives women a wake-up call- forcing them to take a close, hard look at their relationships, past and present, to recognize and learn from their own mistakes. I also found many of the rules to be relevant to other types of relationships as well, from workplace relationships to friendships (let’s just say I could have used this book in high school). Each chapter of the book covers one of Coleman’s 9 “rules” and ends with an action summary and relevant song title and verse so you can pop the accompanying CD into your player and rock out while you read 🙂 The songs vary in style from rock to pop to blues, so no matter your genre of preference there’s a song for you! There were many things I really enjoyed about this book- mostly the fact that the author chose to focus, not on attaining a “perfect” relationship, but to encourage women to love and respect themselves, pray often, and think long and hard about what really matters in a relationship. Bottom line, this is an excellent book to help women recognize what a healthy relationship is (and is not), how to avoid getting drawn into a bad relationship, and how to break it off if you’re already there. An inspiring and worthwhile read, highly recommended! Growing up on Long Island, New York, Sue aspired to be a princess. When she realized that probably wasn’t going to work out, she caught the acting bug by the end of high school. Until a few years ago, Sue, a member of SAG/AFTRA and ASCAP, was a working actress who appeared in several films and numerous theater productions. After seeking something more, she started songwriting and began to sing and play guitar to develop her own songs and lyrics. Along the way, life was going on. Sue was finding herself in relationships with men that never seemed to go anywhere – and she realized it was stopping her from reaching her goals. That revelation led Sue to develop guidelines for herself, based on her personal experiences and those of family and friends. She found that these guidelines were not only successful for her, but appeared to help other women as well. Thus, Breaking Up Is Hard To Do was penned. As for the accompanying album of the same name, music has always energized and helped Sue bounce back and move on after a break up. She wanted to provide her readers with this same experience. Sue’s ability to translate feelings and emotion through lyrics and music provides each chapter of the book with a song chosen to bring it to life and ends with an action summary and lyric. Want to win a FREE copy of Breaking Up Is Hard To Do? Then head on over to our giveaway page by clicking HERE and enter to win!